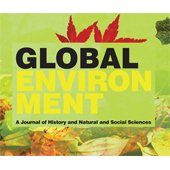 The international journal Global Environment: A Journal of History and Natural and Social Sciences aims to act as a forum and echo chamber for ongoing investigations on the environment and world history, with special regard to the modern and contemporary periods. Its intent is to stimulate and gather studies and research that, in spite of a diversity of approaches and themes, share an environmental perspective on world history in its various facets, including economic development, social and production relations, government, and relations between peoples–and to thus overcome the limitations of a Western-centric historiography. (Text adapted from the journal’s homepage). "Fossilized Memory: The German-Russian Energy Partnership and the Production of Energo-political Knowledge"
"GAU: Nuclear Reactors and the 'Maximum Credible Accident'"
"Knechtsand: A Site of Memory in Flux"
"Forest and Grassland: Recent Trends in Russian Environmental History"
"From the Periphery to the Center: North American Environmental History"
"Apples and Experts: Evolving Notions of Sustainable Agriculture"
"Moving Beyond the Nation State? Reflections on European Environmental History"
"Environmental Change, Control and Management in Africa"
"Climatic Changes in the Carpathian Basin during the Middle Ages. The State of Research"
"Reframing the Land Grab Debate: The Need to Broaden and Deepen the Agenda"
"Environment, Memory, and the Groundnut Scheme: Britain’s Largest Colonial Agricultural Development Project and Its Global Legacy"
"Radiation and Borders: Chernobyl as a National and Transnational Site of Memory"
"An Impure Nature: Memory and the Neo-Materialist Flip at America’s Biggest Toxic Superfund Site"
"Post-Disaster Migrations and Returns in Sicily: The 1908 Messina Earthquake and the 1968 Belice Valley Earthquake"